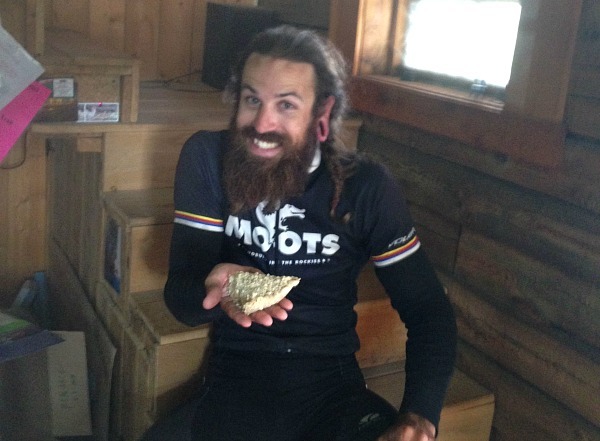 Tour Divide Days 21-24 : Pie Town, Mud, and The Finish! 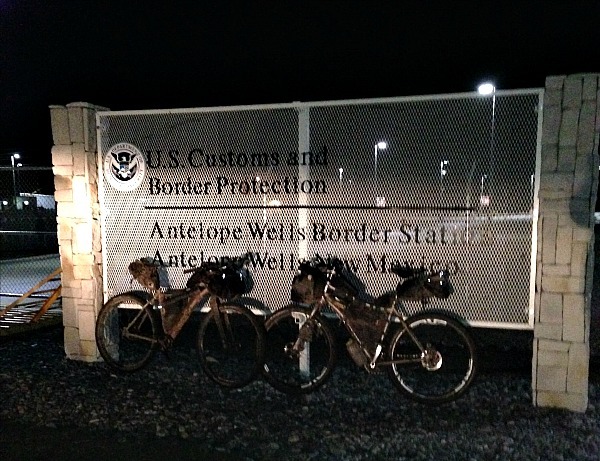 This is my final report on the 2014 Tour Divide race. For those of you that have been following along, thanks for slogging through the long posts. I plan on writing more about what worked, what I would change, and how I planned my days during the ride in future posts. Hopefully, my write-ups have given insight into the race and they can help other riders work towards their own TD adventure. Since I spent so many nights in hotels during the first week of the race, I really wanted Abiquiu to be the last hotel until the finish. Upon arriving in Cuba, the uncooperative weather, cheap hotel option, and very few spots for camping on the open road led Nic and I to decide on one more hotel. In the hotel, over cinnamon rolls and other sugary snacks, Nic and I came up with an ambitious plan to knock out three monster days to finish the Tour Divide. Of course, this would involve 165 miles per day which is something neither of us had done for multiple days in a row. But hey, you have to dream big, right? Kiwi Ken and Ontario Brian also stayed at the same hotel. Somehow we kept ending up in the same places at night. Even though I didn’t see Ken during the day very often, ever since Hartsel, we were ending up in the same locations. It’s interesting because their routine was much different than mine or Nic’s. Ken and Brian were getting up before sunrise to beat the afternoon heat. My approach was the same I had been using all along. Try to get up early with the sunrise and make sure to get a full night’s sleep. Regardless of approach, we were making the same mileage each day. The hotel did not have a coffee maker, a definite sign of a cheap hotel. I made sure to purchase a couple of canned coffee drinks the night before so I could start off the next three monster days with caffeine. There were also a few 5 Hour Energy drinks tucked into my frame bag for caffeine “emergencies”. I wasn’t going to risk having another morning of no coffee/caffeine. 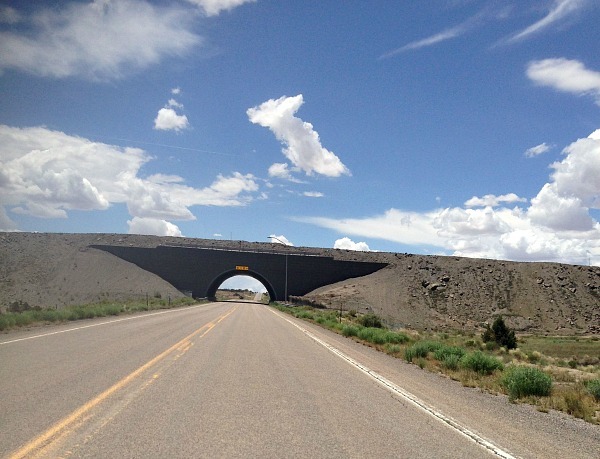 The paved alternate route from Cuba to Grants is 120 miles. Most TD racer take the pavement because it’s faster and there is no sticky New Mexico mud to deal with if it rains. I wasn’t going to complain about a long day of pavement, especially if it would be a little easier on my sore ankle. The initial miles out of Cuba have some rolling hills setup perfectly for tucking into the aero bars and finding a rhythm. Boring! Nic always has a smile and looks for ways to make the riding fun. Instead of ticking away mile after mile, we fit in a few little sprints to the top of the hills and just goofed around on the bike. It was the only time on the ride where I goofed around and it made for some fun miles. Obviously, sprinting and pushing hard wasn’t the smartest idea. Sometimes fun is better than smart. On the map, there are three stores listed on the stretch from Cuba to Grants. We stopped at the first one to top off our water and buy a few more snacks. Rolling up to the store and seeing the bars on the windows was not a great first impression. However, once inside the store, it was clean, well lit, with wide aisles and smiling people. It may have been the nicest gas station along the entire route. Stopping at the first store turned out to be a very wise choice. The rest of the day would be desolate with no services. The other two stores listed on the ACA maps were closed down. This was the only opportunity for water or food until reaching Milan and Grants more than 80 miles away. By mid-afternoon, a storm was approaching as Nic and I rode towards Milan. The wind picked up, the clouds got really dark, and we were going to get soaked just a few miles from Grants. With rain gear deployed, we were as ready as we could be. Somehow, the storm stayed just off to our left and we were able to ride into a Dairy Queen for some welcomed ice cream. On towards Grants where we would be filling up for the long stretch to Pie Town and the Gila. It was July 4th and most places were closed. There was a party going on at the park. Judging by the stumbling people at the park, we stayed far away from the drunken festivities and focused on finding some place to eat. After yet another burger for dinner, a gas station for re-supply was the next objective. Grants is not a large town, but it’s big enough to have several retail areas. When you’re riding through on a bike, you miss the little one road towns that have everything within two blocks. We ended up going out of our way about a mile to find a gas station. Inside, we proceeded to load up on anything that looked resembled food. We needed enough supplies for the rest of that night, the entire next day, and then half of the following day before we made it to Silver City. Due to our schedule, Pie Town was not going to be open when we rolled through. Disappointing to ride 2000+ miles and miss out on pie in Pie Town! With $70 of gas station food filling every possible space on my bike and portable backpack, I was ready to roll out of town. At least the bike would get lighter as I ate and drank my way to Silver City. With 120 miles already covered for the day, the goal was to get another 40-50 in before camping for the night. The first 45 outside of Grants are paved. As the sun set on July 4th, my ankle started to reach it’s limit for the day. It’s only surprising that I lasted more than 120 miles before it started to wear out. The last 30 miles of the day were a struggle, even on the easy rolling roads. Once the pavement ended and we took the turn towards Pie Town, the road turned into an extremely washboarded and sandy mess. A couple of times, I had to walk through the sand because I got bogged down or thrown off track. It was a frustrating pattern of smooth road for a few feet then some washboard and stretch of sand to round it out. A few miles into the sand trap, we passed a turn off where the maps indicated dispersed camping. Nic and I setup our tents/tarps just off the edge of the road and were asleep soon after. It had been a long day of pavement and my longest distance ever covered on a bike – 163 miles. We started the day’s ride back on the sand trap of a road. There were still a few spots left to navigate, but the road slightly improved after a short while. That’s when we saw the elk. Yes, there are elk in southern NM. Even though I had seen the signs along the road, I really didn’t think this area would be elk habitat. Three elk, a rainbow, and the end of the sand trap – the day was off to a good start. Next up was Pie Town and the sad fact that all of the cafes would be closed when we rolled through mid-morning. There was going to be no pie in Pie Town. When we reached the highway crossing in Pie Town, we stopped to consider our options – keep riding or wait a few hours for a cafe to open. We each had a lot of food packed on our bikes, but we wondered if it was enough to get us to Silver City which was still over 200 miles away. A car pulled up and a woman got out to ask our names. Once introduced we were greeting with a giant hug from Nita, owner of the Toaster House in Pie Town. She invited us to stop by and eat whatever was available in the house. 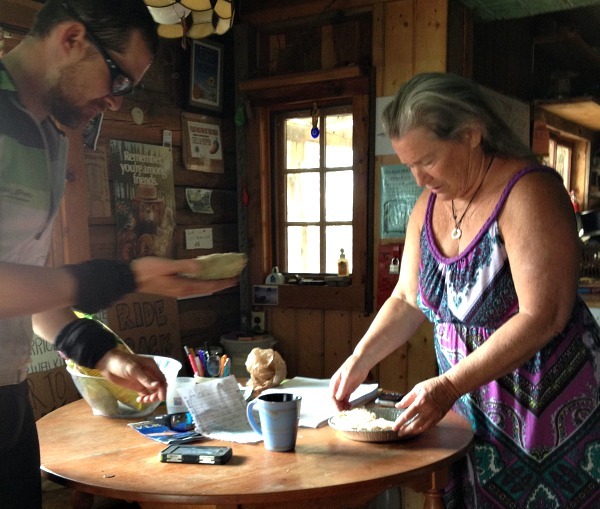 She had converted her own house into a hostel for cyclists on the TD/Great Divide Route and hikers on the CDT. That morning I feasted on coffee, applesauce, frozen pizza, and banana coconut pie. Exquisite meal even though it was a strange combination. There was pie in Pie Town after all! Nita, like Kirsten at the Brush Mountain Lodge, didn’t ask for any money. She just told us storied, asked about our rides and did it all with a smile. As we were eating our pie, Ken and Brian rolled up and joined in the pie party. We were all smiling and thankful for a big meal before attacking the Gila. As it turned out, the surprise Toaster House meal was very critical to not arriving in Silver City completely out of food and starving. The $70 of gas station food purchased in Grants would not have been enough to get me to Silver City by itself. Leaving a town after a big meal always makes the riding easier and more fun. That all changed after crossing Hwy 12, about 35 miles south of Pie Town. The roads got worse and the washboard torture returned. The constant impact from the washboard caused my ankle to start hurting again. It was way too early in the day for that to happen. Plus, I had many miles to go if I was going to finish the race the following day. To make matters worse, a storm was building. Based on our direction and the clouds, we knew that we were in for some wet riding in the Gila National Forest, exactly the place you don’t want to encounter rain and mud. Let’s just say “I fought the Gila and the Gila won” – put to the Clash’s “I Fought The Law” tune. After a stretch of pushing through the grass on the edge of the road, the road surface became more rocky which made it rideable. Into the night we rode, pushing for the Beaverhead Work Center. The day had started out with three elk. Now there were lots of little frogs on the road. Luckily for the frogs, we managed to miss almost all of them with our tires. At the Work Center, I was able to refill my water and take a short break. When I saw the vending machine, I got excited about having a Coke to keep me going. That is until Nic informed me it was out of service and crushed my dreams of more sugar and caffeine. At least I had clear weather to make the night riding more enjoyable. Nope, not even that was happening. As we sat at the Work Center, the rain started to fall again. All of the mud and grit had worn the brake pads, causing them to slow down the bike, but not really stop it. The levers could be pulled to the bar and not stop the bike. The first downhill after the Work Center was fast with some tight turns. Combine that with rain and darkness and you have one sketchy descent. Somehow, we made it to the bottom (Nic being much faster and crazy descending than me) where we adjusted our brake pads to give us a little better stopping power. After two of the climbs and downhills, I had reached my limit. It was around 1AM and I was dragging. I was definitely tired after 19 hours of riding, but my ankle wasn’t allowing me to ride up any uphill sections. Nic and I talked over our plan of trying to finish the remaining 190 miles the following day. I knew I was at my limit for the day and would have to stop for the night, leaving myself a monster 200 mile day to finish. Nic was feeling good and running low on food so he decided to continue riding through the night and get close to Silver City. I don’t know how he kept riding, but he did. He put in several more hours of riding through a constant rain that night. Me, I bivvied just off the side of the road, leaving myself with two long climbs before I could get out of the Gila the following morning. As soon as I got tucked into my sleeping bag, the rain started to fall harder. I was happy to be in my bag with my tarp over my head. I had been so tired that I considered not setting up the tarp. That would have been an epic fail. I slept fitfully and woke up with the sunrise. Was this going to be the final sunrise and full day of riding for me on this adventure? Was 190 miles in one day with an ankle/achilles that wasn’t cooperating possible? The climbs out of the Gila were frustrating to say the least. I felt good on the first one and actually rode most of it. The second one, not so much. From the rains the previous night, it was full of the sticky mud that clogged up drivetrains. I was pushing my bike up the road and getting frustrated. I kept thinking about what Nic encountered riding through that area the previous night in the pouring rain. After some slow going, I made it to the top of the climb and had a long downhill to the pavement. But this was the Gila, and it wasn’t going to let me out of its grip easily. The road was full of the worst kind of washboard known to mankind! There were sections where the entire width road was a giant washboard. There was no smooth or worn portion. The only way through it was to bounce and rattle and shake until you got through it. I tried to roll into the sections with as much speed as possible while my hands, teeth, and bike all chattered over the washboards. Once the washboard slowed me to a crawl, I could lightly pedal through the remaining section. This happened over and over again. I remember yelling out at the road several times after I had been bounced around and my chain had bounced off the bike. Luckily, no gear bounced out or broke off. Finally, I made it to the pavement section. I was done with the Gila and it had definitely won. 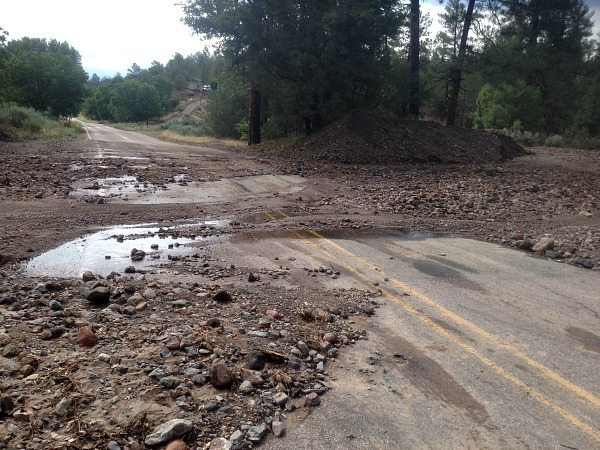 On the road, I passed several washouts with sand, rocks, and mud covering the road. The storm the previous night must have delivered a lot more rain that I thought. While on the road section towards the CDT alternate, I made the one decision in the race that I regret. 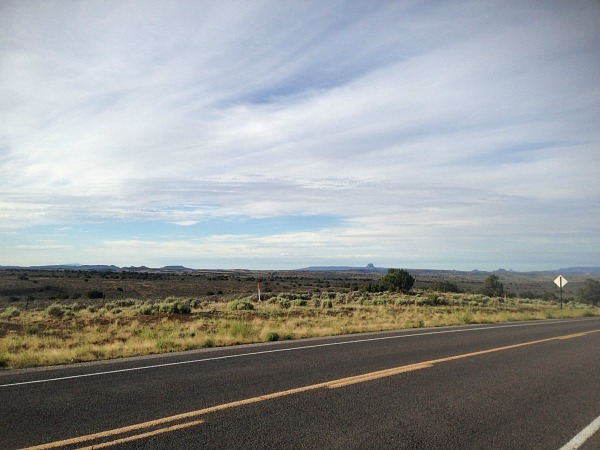 I decided not to ride the 7 mile CDT section and to ride the road around it instead. I didn’t want to see any more of that Gila type mud. Seeing the washouts along the road, I figured that section would be a mud slog full of walking. 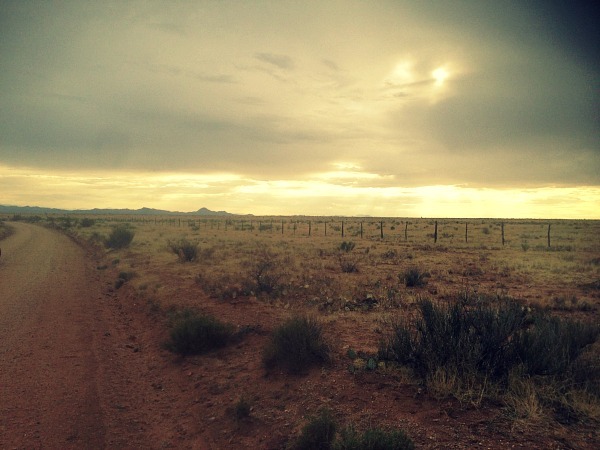 The road is the official ACA route for the Great Divide Mountain Bike Route. The Tour Divide uses the CDT alternate as it’s “official” route. Due to some confusions on trail closures, the organizers allowed the road route as an allowed detour for the 2014 Tour Divide. Looking back now, I really wish I had taken that CDT section. It was one of the few singletrack sections. Plus, I don’t know if I’ll ever get back to ride that stretch of trail. The road route certainly wasn’t an easy path. The road was really steep. It was a beautiful area to ride and walk through. It was steep enough to have me moving at a snails pace even with mountain bike gearing. My ankle was not happy and I knew that I had more than 150 miles left to go. Sometimes walking is the best option. 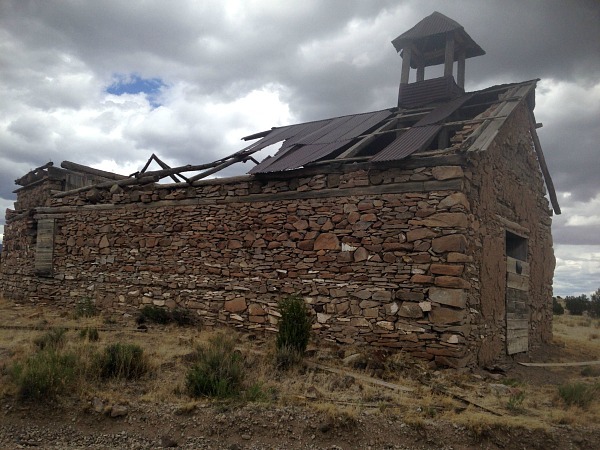 All of the frustration of the Gila, the washboards, and the steep climbs washed away on the downhill into Silver City. Being tucked into the aero bars swooping through turns has a way of easing my mind. When I arrived in Silver City, Nic was still in town. I thought he would have been working his way to the finish after his monster ride the previous night. Instead, we got the chance to ride the final stretch together. It was going to be great to start the ride with him and also finish the ride together. He was at a breakfast cafe which stayed open a little late to let me eat a big plate of biscuits and gravy. I like my biscuits and gravy, oh so much. Fueled up with breakfast food and snacks from the gas station, we headed out of town in the early afternoon heat. As we cruised on the pavement, I asked Nic if he had ever started a century ride in the middle of the afternoon. We still had 120 miles to cover to make the finish. It was going to be a long, long night. Of course, as we turned onto the final miles of dirt for the Tour Divide, we caught another thunderstorm. It wouldn’t be the 2014 Tour Divide if there wasn’t bad weather on the final day. We started with days of rain and snow. We would be finishing with several days of rain and mud. We took cover under a small tree and waited for the worst of the storm to pass over. Once back on the bikes, it was muddy but easy riding. As the cool air from the storm turned back to desert heat, Nic managed to take off his rain jacket and pants while continuing to ride. Not sure how he managed that, but the man has skills. A nice surprise awaited us at the Separ exit. What looked like a souvenir store actually had snacks, drinks, and frozen burritos in the back. Score! Nice and I sat outside eating our burritos as evening approach. The final 50+ miles would be in the darkness with only our headlights to guide us to the finish. The 25 mile stretch from Separ to Hachita was the hardest stretch for me on the day simply because I was tired and I was beginning to fall asleep on the bike. Every mile was a struggle. 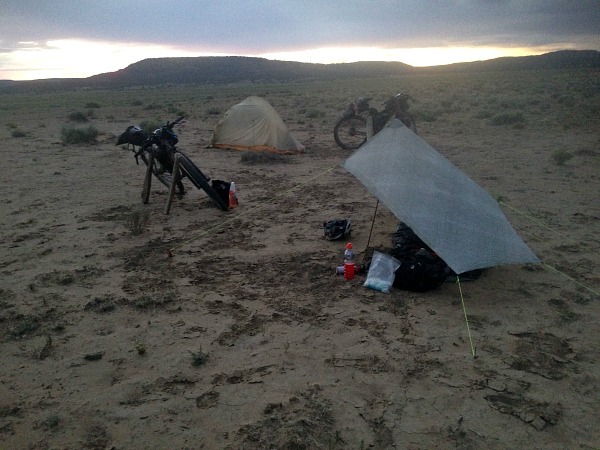 At 11PM, we rolled into Hachita, both of us dragging and wondering how we would finish the final 45 miles. After a snack break, neither of us was looking forward to getting back on the bike. I think we both had the look of “I need a short nap” on our face so we agreed to take a 15 minute nap on the picnic tables. Closing my eyes and drifting off for a light nap was just what I needed. Leaving Hachita, Nic must have been even more rested. He gapped me by a substantial amount and it was just me and the lonely, dark, flat road ahead. A few miles outside of Hachita, I started to get stomach pains. Was it nerves or excitement over being so close to the finish? No, it was the frozen burrito wreaking havoc on my insides. It’s hard to find any type of cover to do your business out in the desert, especially at midnight. Back on the bike, I felt better, but my stomach was still a little unsettled. I was nervous about eating snacks or even drinking too much water. The last thing I wanted was to be pulling over on the side of the road all the way to the finish. A few miles later, my stomach settled down and I could stop for a snack. When I stopped, I pulled out my iPod for only the third time in the entire race. It was me, my music, and my bike that would be pushing to the finish. It was after midnight and based on my pace, I would be finishing around 3AM. With about 30 miles to go, I got into a nice groove. After 2700 miles of racing, my legs still had a bit left in them and I wanted to push to the finish. I was cranking hard and playing mind games with the mile markers. The road had every tenth of a mile marked so you could see exactly how much progress you were making. My games consisted of staying in the aero bars for a certain length, standing up and cranking for a tenth of a mile, or getting a snack once I passed a certain mile marker. Nic had ridden away from me after Hachita and had quite a gap after my burrito “incident” on the side of the road. As I was cranking away I caught a glimpse of his bike at the side of the road. He had stopped for a little snooze. I felt bad waking him up, but I’m glad I did. If either of us had laid down for more than a few minutes, we would have been completely out. We could sleep after the finish. At that moment, we had pedaling to do. The final stretch had Nic and I riding side by side completely focused on our own ride. Our music was cranking, we were keeping the pace high, and we were fighting for the finish. This was one of my favorite parts of the ride even though there was no laughing, no views, and no mountains to see. We were simply two guys giving it everything we had to complete our dream ride. Of course, we did chat a little about racing the final stretch since this was a race, after all. I was expecting a race of 100-200 yards once we saw the border. Nic, he had other plans. He looked at me with 3 miles to go and said “let’s race! !” We “raced” for all of three pedal strokes as he darted off in front of me. He’s a much stronger rider and I had no chance. My goal was just to keep his light in sight and push myself. I crossed the finish at 2:58AM for a finish time of 23 days, 18 hours, and 58 minutes. I had done it! Little ole me had just ridden his back from Canada to Mexico. After lots of hugs with our family that had made the trip to the border, a few pictures, and some snacks, it was over. I was a Tour Divide finisher. Megan, glad you enjoyed the write-ups. That’s exciting that you are gearing up for a ride next year. Since I’m not riding it, I’m sure the weather will be perfect. Let me know if you have questions on the experience, route, gear, etc. One of the reasons I wrote so much was to hopefully help future riders. Congrats Andy I enjoyed reading the posts. Sounds like a hell of a trip. I would have quit after the first 100 miles. It is awesome that you were able to plan and achieve a dream. Great write-up again! Although we didn’t ride together I was with you as I read your account! The end really is soooo bitter sweet. I shed a few happy/sad tears pushing to the end. Scotty (Kiwi Ken to you) has talked a bit about riding with you and meeting up at various points. Amazing how different strategies can get you to a similar place and time. Love that about these longer races! Thanks for reading through all of the long posts Rob. Yes, Scotty and I had different riding styles. From Breckenridge all the way to Pie Town, we ended up at the same spot almost every day. Crazy how that works, but it was great to see him and talk about how his riding was going each day. What’s next? Nothing crazy right now. I’ll be doing some fun bikepacking rides with friends and taking my kids on some camping trips. I miss the training and striving for a giant goal. However, I do enjoy sitting down and relaxing a bit more these days.